Running a retail business is no walk in the park, no matter the scale of your operations. If you are a manager or owner in the retail industry, you know best that the challenges come from every corner. There is so much to juggle simultaneously and at the same time, the idea of constantly thinking about driving customers into the outlets to increase sales. If managing retail stores is hard, imagine managing diverse and various employees in multiple stores. Moreover, the steady growth of e-commerce in recent years has brought profound changes and given rise to new rules of the game. In order to successfully compete and thrive in this changing landscape, even the more established brick-and-mortar retailers are now busy with reinventing their businesses and improving their products, services and productivity. Hence, it is crucial that retail businesses are able to recognize and arm their business with the right tools and technology that can help monitor the staff effortlessly and effectively. With this in mind, two of the most influential retail companies in Malaysia have opt to utilize TimeTec Smart Solutions. Firstly is JAKEL TRADING Sdn. Bhd., a company that began in January 1983 when the late Mohamed Jakel Bin Ahmad started his small retail business in Muar, Johor. The company was carrying JAKEL TRADING as a trademark in the textile industry to win over their customers. Right until the late 1990s, JAKEL TRADING became the major wholesaler and distributor of the textile industry in Malaysia. With the goal of “ONE BRANCH, ONE STATE”, JAKEL TRADING has opened 20 branches throughout Malaysia alongside the intention to conquer the textile industry from north to south of the country. That number has thus been increasing ever since and with the recent opening of Wisma JAKEL in Shah Alam, comprising of 80,000 square feet; the branch was accorded as the Largest Textile Retail Outlet in the Malaysia Book of Records. Looking at this magnitude, it is without doubt that a lot of resources have been placed onto the Management at JAKEL in order to handle its massive number of employees nationwide. However, that’s all about to change as JAKEL is now adding TimeTec Smart Solutions (TimeTec TA & TimeTec Leave) into the mix. The company subscribes to TimeTec TA and TimeTec Leave in addition to deploying a number of FingerTec Biometric Solutions (AC100C, TA100C) to further promote automation as well as a more comprehensive management system. That said, the switch to cloud doesn’t just end there as F J Benjamin, an industry leader in retail with a rich heritage dating back to 1959; has likewise chosen TimeTec TA as their go-to selection for next level workforce management. Headquartered in Singapore and listed on the Singapore Exchange since November 1996, F J Benjamin has offices in three cities, manages over 20 iconic brands and operates 250 stores in addition to running two core businesses: Luxury/Lifestyle Fashion Retailing Distribution and Timepiece Distribution. As such, the company exclusively retails and distributes brands such as Guess, Marc Jacobs, Superdry, Alpina, Frédérique Constant, etc. 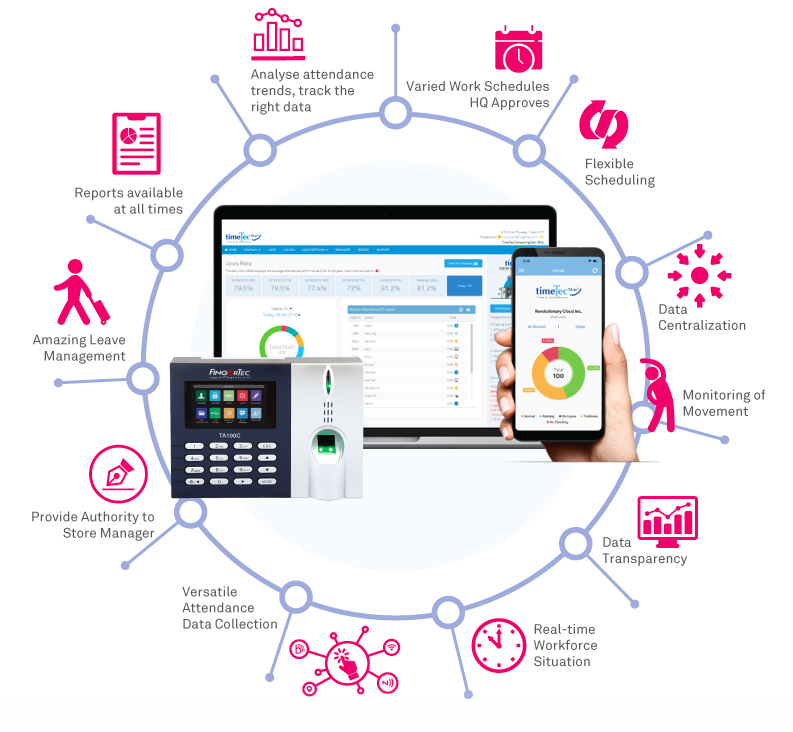 With TimeTec TA, all attendance management within F J Benjamin, be it local or international, can be summarized by our Smart Solution Mobile Application. This is due to the fact that TimeTec TA App can be installed onto the smartphones for both employers’ and employees’ access. With just an Internet connection, employers can tackle any workforce issues by monitoring their staffs’ attendances and easily rectify any disciplinary issues, i.e. tardiness, absenteeism and many more. That said, F J Benjamin (M) Sdn. Bhd. subscribed its employees in TimeTec TA together with 75 units of TA100C. Sooner or later, changes for the future are required and in order to get ready for the changes that come, retailers need to think of a way to automate processes to achieve better performance. TimeTec Smart Solutions are comprehensive tools that can assist retailers in managing their workforce’s schedule, track their staff’s whereabouts and to gather all the data for various other purposes. Look no further as our Smart Products are truly one of a kind.